Tom Archdeacon, sports writer extraordinaire, and Mike Elsas- artist and gallery owner extraordinaire- are putting up an exhibit of Tom’s boxing posters and pictures from his long career covering boxing. Show opens tonight- on Brown Street in the Oregon District– right across from Thai 9- at the Color of Energy Gallery. 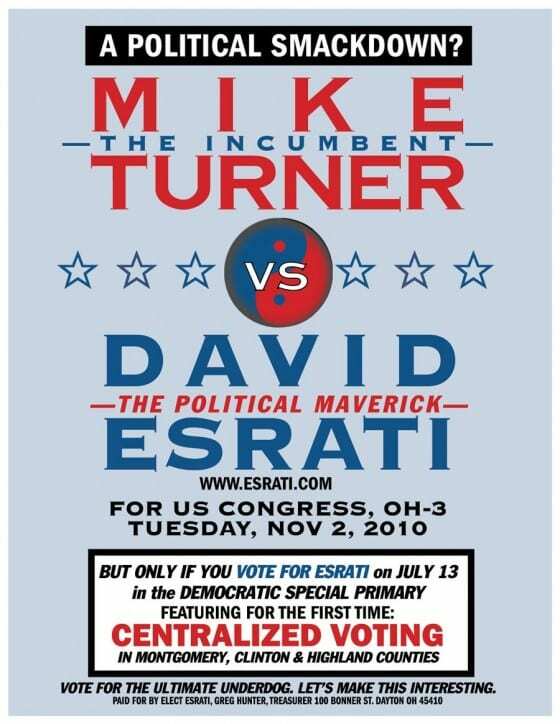 To frame up the kind of battle that I would give Mike Turner in November- I thought I’d put together a poster for the coming fight for your support. Click on the image below and you can download an 8.5x 11″ PDF and print it out- and I’ll have a few at the opening tonight. Why have elections if they aren’t going to be interesting? If you want a 12×18, I’ll have them at the office- for a small donation. Remember to request an absentee ballot and get it in early. If you live in Montgomery, Clinton or Highland Counties- the centralized voting may be fraught with difficulties.